Oadby & Wigston Borough Council is committed to supporting armed forces personnel and veterans. The community covenant aims to encourage local communities to support the armed forces in their areas and to increase public understanding and awareness of issues affecting the armed forces and their families. For more information on Armed Forces Community Covenant visit gov.uk. 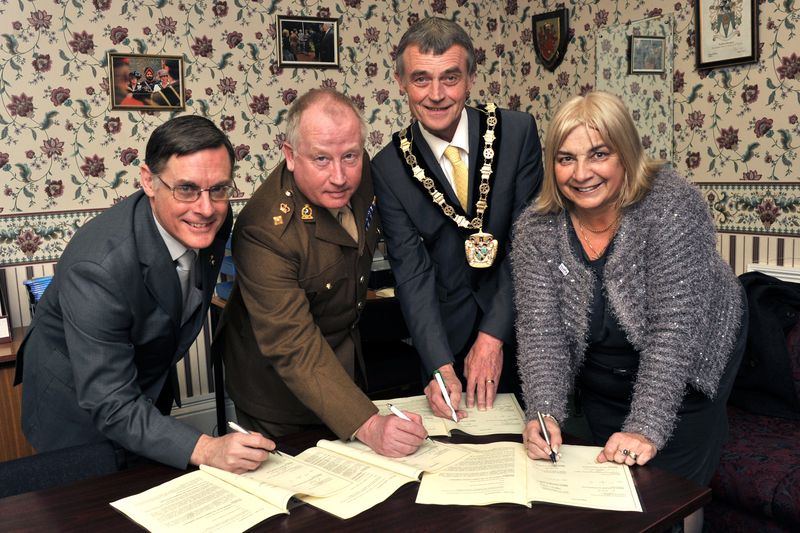 The Oadby & Wigston Community Covenant was signed on 4th April 2014 declaring how the Borough will support members of the armed forces. The Mayor and the Armed Forces Champion of Oadby & Wigston Borough Council were joined by Lieutenant Colonel Richard Pope and David Atterbury, County Chairman of Leicestershire and Rutland Royal British Legion in signing the covenant. The Armed Forces Community Covenant is a public declaration that the Council will work to support serving and former members of the armed forces community. To appoint a Councillor as the Council’s Lead Member and Champion for the Armed Forces. This will ensure that recognition of the armed forces will be embedded within and promoted by the Council. The first incumbent of this position will be Councillor Lynda Eaton. To research and build an understanding as to how many current and ex service men and women and their families reside within the borough together with any other information that will assist the Council better understand their issues and needs. To communicate clear and positive messages to other organisations and residents which demonstrate that the Council takes its relationship with armed services and personnel seriously. Bestow the Freedom of the Boroughin recognition of the role the Armed Forces play. Give an ongoing commitment for the Mayor of the Borough will represent the Council at armed services and cadet events.